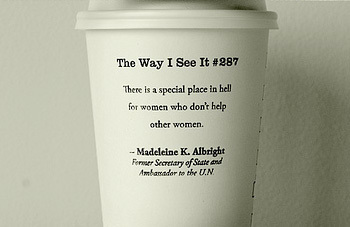 Palin Misquotes Albright: "Place In Hell Reserved For Women Who Don't Support Other Women"
Palin seemed to realize that the line could be viewed as grating. As the audience cheered, she remarked: "Okay, now, thank you so much for receiving that well. I didn't know how that was gonna go over. And now, California, let's see what a comment like I just made, how that is turned into whatever it'll be turned into tomorrow with the newspaper." Albright responded to Palin's remarks in a statement to the Huffington Post on Sunday. "Though I am flattered that Governor Palin has chosen to cite me as a source of wisdom, what I said had nothing to do with politics. This is yet another example of McCain and Palin distorting the truth, and all the more reason to remember that this campaign is not about gender, it is about which candidate has an agenda that will improve the lives of all Americans, including women. The truth is, if you care about the status of women in our society and in our troubled economy, the best choice by far is Obama-Biden."